Wow, look at this box full of Stampin’ Up! goodies that arrived on my doorstep last week. 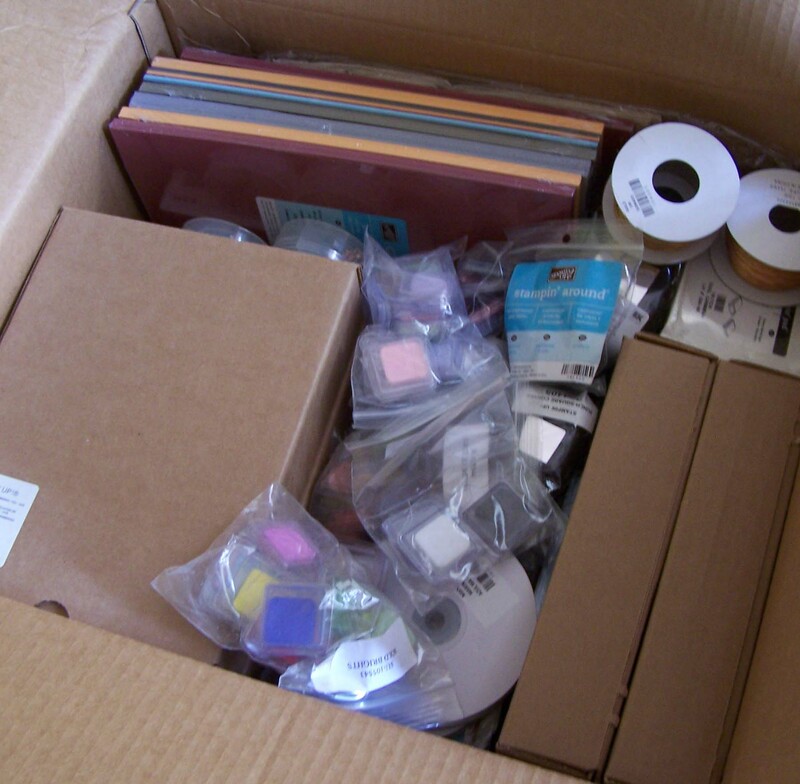 This box is full to overflowing with product which was donated by Stampin’ Up! for my fundraising night. What an incredible, and very generous company. How can you get your hands on some of these goodies? You could come along to my Cancer Council fundraising night which will be held on Friday 7th May at 7.30pm. Each person will pay a $10 entry fee which will go straight to the cancer council, and for your $10 you will get to make some cards to take home, and also get a bag of goodies to take with you. There will also be prizes, raffles, auctions, tea, coffee and nibblies, and lots of stamping fun! If you have never stamped before, you are still most welcome, you can have a go and I will be there to help everyone out. And for those of you interstate or who can’t make it on the night, all you need to do is to make a donation online, and I will send you a thank you pack in the mail! And on that note, I have decided that I need to take a little more time out. The past five years have been full of incredibly stressful events for us, with both of my parents diagnosed with cancer at around the same time, my Mum spent 5 months in hospital, my Dad was having Chemo and then radiation during this time. A few months later, Jamie was born, and then five months after that my Dad passed away from the lung cancer that was a very aggresssive form. Following that my Mum had a fall and a hip replacement, then she moved house, we moved house twice, and then of course in the last six months or so, I have been caring for Mum through another bought of cancer which took her life. So through all of this I have had little, if any, time for me, and my health both physically and mentally, as well as many other parts of our personal lives, are in great need of some TLC! So I have decided that all classes will be on hold until the start of June. This will give me a chance to recharge the batteries and get some inspiration back. I will continue to try to post some of my new creations, and will also bring you news and new ideas from the Stampin’ Up! convention which is happening at the end of May. I will be taking bookings for workshops now for the start of June and into the rest of the year, so get in quick if you are interested in earning FREE Stampin’ Up! products, workshops are heaps of fun, and always very popular, and I will be limiting the number of workshops I do each month. Just contact me if you want to know more, or check out the Host a Workshop page. I will also be taking orders during this time, so if you need to place orders just give me a call or email. I’ve been trying to design wedding cards and I havent had much luck with what shape and design itll be. Your blog is a big help! Thank you for the ideas!